We claim to do tube weaning and we believe that this is right. But what is tube weaning? In short words, in tube weaning, we support the child (and its parents) to learn to eat. Not more and not less. For this, food is everywhere, at the floor, in front of the child, the toys are food and even the towel with which mum and dad wipe the child smells like food. And if the child is allowed to be a little hungry, it feels just like anyone entering a restaurant to have lunch or dinner. The smells, the tase, the environment, the voices of people around, anything hints towards food. In those restaurants, there is no TV and no Wifi available. The smells and the taste of the food is so good that it is just joy to be there and satisfy his or her innate need. Many children who we had the pleasure to meet in our Eating Schools have undergone a feeding therapy before. Feeding therapy has a different concept and a different underlying philosophy. 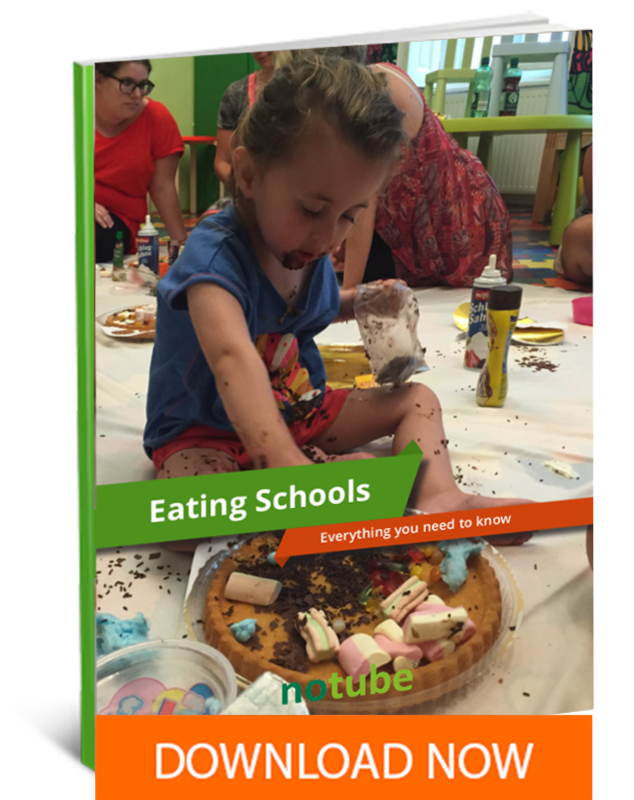 Tube weaning aims to help the child to feel joy of eating within its individuality and autonomy and to feel the joy of perceiving and satisfying a need (hunger). Feeding therapy on the other side follows the concept that the child cannot eat or does not really want to eat, to it needs active help. Therefore, feeding therapy has a role in many therapies. The therapist knows how it is done right. He or she knows that he or she has to grab into the mouth or for example to touch the cheek with a vibrating instrument and if the therapy is successful, the child opens its mouth and starts to eat. Having said that, we are not against feeding therapy. The advantage is that the parents can give off the responsibility and the feeding therapist tells them what to do. Exercises are shown and performed which surely help many children. To be fair, we at NoTube usually only see those children, where feeding therapy which has a long history and a lot of experience, was unsuccessful. Therefore we are a little sceptic against feeding therapy. We like to accompany the child´s (and its parent´s) path rather that to lead. Less interventions and instructions. One of our team members, Eva Kerschischnik is a certified Castillo Morales therapist. Castillo Morales fits perfectly into our therapy concept. Dr. Castillo-Morales also wants to learn together with the children and the parents. He observes and gives little hints how to get or stay on the right track. Tube weaning does the same thing. Parents and children come to us electronically because they got stuck somewhere. Either the child is tube-fed although it is not medically necessary anymore or the child only highly selective so that parents and doctors are concerned that it may suffer a deficiency. In this situation both strategies differ. Tube weaning will result in reduction of tube feeds or the amount of selected food, whereas eating therapy would work in the child’s oral region and change the feeding position or even deal with breathing and speech. However, although opposing our concept, feeding therapy can help many children and has a legitimate place in the therapy of eating behavior disorders. Therefore we see both concepts as different ways to cure. We cannot really match feeding therapy with our concept. The child´s autonomy and the free choice of the parents are too important to us. We believe that every child, even disabled ones, can and must find its own way. Therefore we refuse both forced feeding as well as manipulations at the mouth or overpowering which may lead to panic. We want to help the parents to find a way out of many unsuccessful tries and want to accompany them in a caring and sometimes strict way. Feeding therapy with interventions into the child´s or parent´s autonomy does not fit into this concept. Also, we don´t work with “instruments” which are known from speech therapy. We do know stimulators and vibrators, but we don´t use them because it doesn´t fit into our method. Families who decide to come to us should know that they will deviate from concepts, they may know from e.g. their speech therapist. We hope that their current or previous therapists may have the quality and collegiality to support and accompany the families visit at NoTube. We can’t guarantee for success but switching from feeding therapy to tube weaning is worth a try. And we can guarantee to be caring support for every family who may decide to go the other way round. NEXT ARTICLE NoTube's "topic of the month"